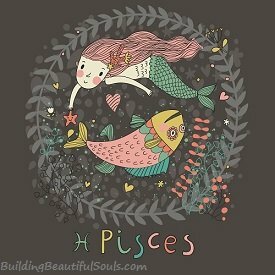 Fragile, sensitive and elusive, those born under the Zodiac Sign of Pisces are shimmering souls filled with empathy, compassion and love for all. Pisces in general are sensitive, but children even more so. The tiniest changes in their environment impact them in huge ways. They’re very caring and concerned, and will always be watching out for other people (or animals) that they see as vulnerable. Your Pisces child is wise beyond his or her years, and may well be an old soul. You may hear this sagacity in a story they create, or see it in a painted image. This is one way that Pisces children communicate ideas and visions, even if they may not recognize them fully yet. And don’t be surprised to discover your child having very long talks with imaginary friends. What may prove difficult for you is that little Pisces has a rich imagination. It takes an astute parental eye to know what is real, what is “possible” and what is completely fabricated. That fanciful element in Pisces often leads them toward arts that allow them to immerse themselves in another world – such as reading fantasy books or watching/acting in plays. Join them in those realms – it proves delightful for everyone. On the home front the best gift you can give Piscean youth is an abiding sense of love, peace and nurturing. They tend to give generously to others – it’s your job to refill that well. It is also your job to help them create boundaries, especially with people who would use their kindness thoughtlessly. When you accomplish this, you’re setting your Piscean on a path of self-reliance where they can endure much more than anyone anticipates.